Create reverb exactly the way you want. VariVerb 2 creates various types of reverb based on algorithmic calculations, without using impulse response. Create classic, modern or artificial reverb effects with various parameters such as room, plate, spring, and nonlinear reverb with this high-quality plugin. VariVerb 2 is a precise VST plugin that adds more depth to your tracks. Adjust room size, width or diffusion with a few clicks and create the reverb room with the exact sound aspects that you need. More depth. More texture. More possibilities. The presets for instruments, halls, rooms and vocals are based on a variety of algorithms and can be used not just for making improvements, but as the starting point for complex sound design. The reverb created is not based on impulse responses, but on complex reflection patterns and different software models. 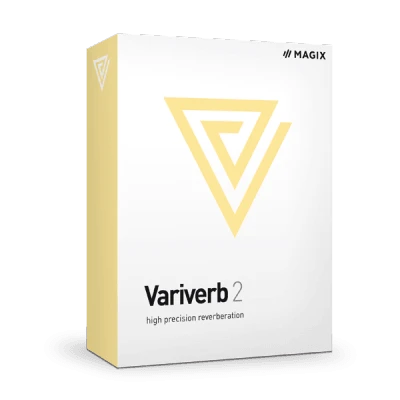 VariVerb 2 offers enormous potential in terms of sound aesthetics, especially in effects areas such as modulation, which can't normally be created with a convoluted reverb. VariVerb II is an internal VST / AU effects device. This reverb unit creates classic and modern artificial reverb effects such as room, plate, spring, and nonlinear reverb based on algorithmic calculation, i.e. without using impulse responses. VariVerb II is available as a VST plug-in.